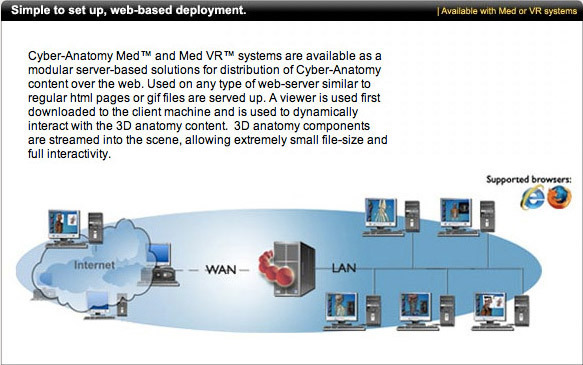 Cyber-Anatomy Med™ is the world's most advanced medical-level anatomy software. Built on advanced engineering and gaming technologies. Every structure in the human body was built from the ground up in 3D, culminating in over 4,300 structures and over 13,000 identifiable landmarks. This product is as a result of 7 years of work by a large team of engineers and medical professionals. Elsevier, the publisher of the world's standards in anatomy (Gray's Anatomy and the Netter Atlas) has selected Cyber-Anatomy to launch the most innovative product. The software application contains all systems, can be taught using systemic or regional approaches, encompasses an intuitive easy-to-use method for dissecting by simply "peeling" off any structure. From the smallest of ligaments to the most minute of nerves and vessels, each structure is clinically labeled. Cyber-Anatomy Human Software products are used by health professionals and students at every level to show or learn anatomy. It is used for patient education and illustrative purposes. A user of the Med version, for example, can fully interact with the anatomy to "Peel" muscles, follow nerve roots, examine skeletal anatomical landmarks, understand muscle insertions and origins, and look at minute details of organs. High school students in biology classes can better understand the various systems of the body in a fascinating 3-dimensional manner.